It wasn't the Battle of the Sexes. It was the Battle of the Males. 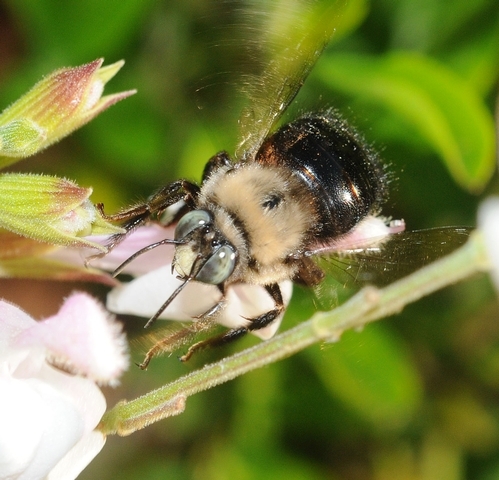 I spotted two male carpenter bees buzzing loudly over the salvia (sage) in our back yard Saturday morning. Each was lying in wait for a female, but instead found a competitor. Now male carpenter bees are quite territorial and these two were no exception. The would-be suitors chased one another all over the yard, from saliva to salvia. One would buzz into a blossom for a quick nectar fix and the other would aggressively chase it away. One stopped long enough, however, for me to capture his photo. It's the most common carpenter bee in the Davis area, Thorp said. "It loves to nest in redwood structures: fences, arbors, picnic tables, etc. It is the smallest of the three carpenter bees in California. The males are quite variable in hair color on the thorax: from virtually all dark, to some yellow in front of the wing bases, to virtually all yellow on top." Another carpenter bee increasingly found in the Davis area is the valley carpenter bee. The sighting of the male, a green-eyed fuzzy yellow "teddy bear," prompts lots of calls to the UC Davis Department of Entomology. "What is it?" they ask. 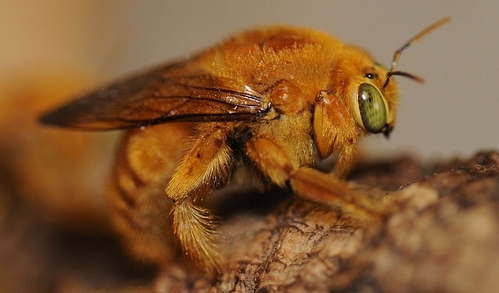 We point them to our Web page for the scoop on the three types of carpenter bees found in California. As spring unfolds, expect to see more of them.